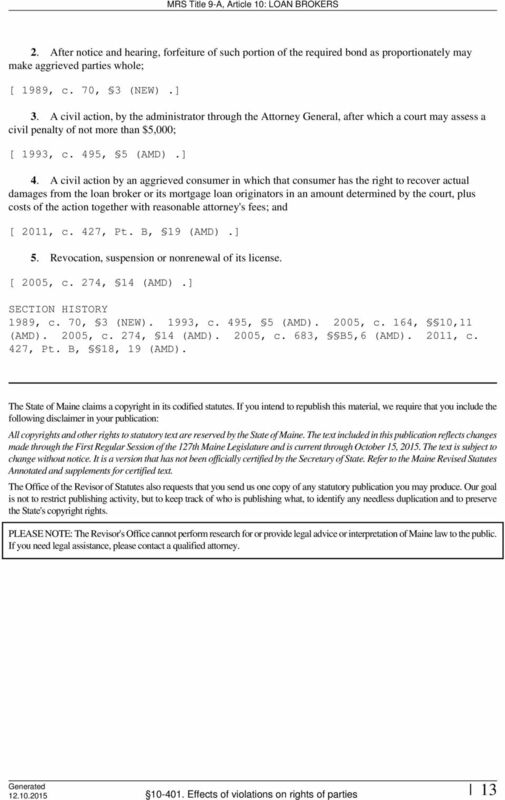 Download "Title 9-A: MAINE CONSUMER CREDIT CODE"
TITLE 81. BANKS AND FINANCIAL INSTITUTIONS CHAPTER 22. MISSISSIPPI DEBT MANAGEMENT SERVICES ACT [REPEALED EFFECTIVE JULY 1, 2013] Section 81-22-1. Short title [Repealed effective July 1, 2013] 81-22-3. 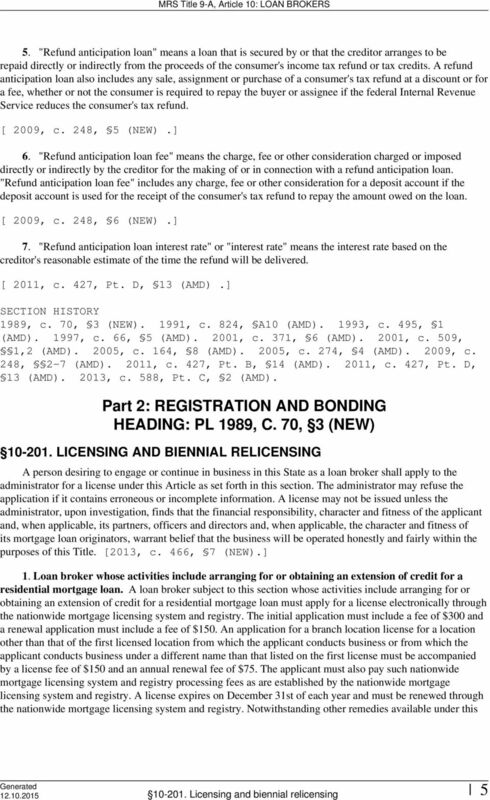 Chapter 21 Credit Services Organizations Act 13-21-1 Short title. 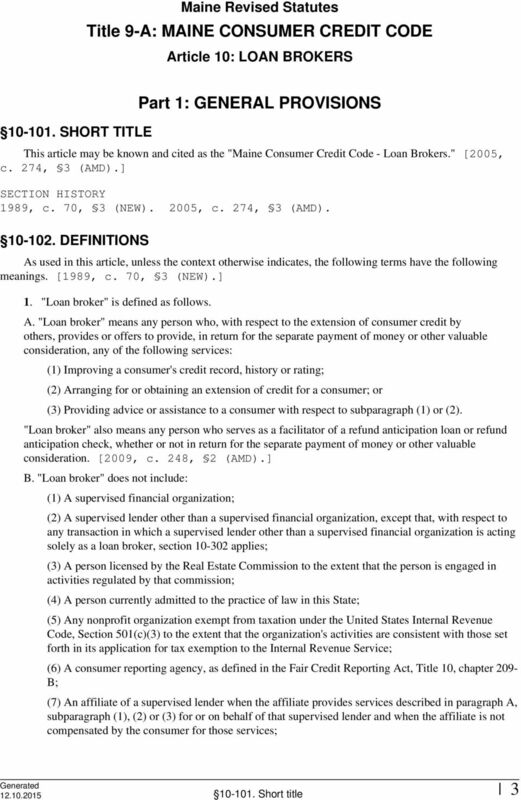 This chapter is known as the "Credit Services Organizations Act." Enacted by Chapter 29, 1985 General Session 13-21-2 Definitions -- Exemptions. Title 20-A: EDUCATION Chapter 409: DEGREE-GRANTING INSTITUTIONS Table of Contents Part 5. POST-SECONDARY EDUCATION... Section 10701. DEFINITIONS... 3 Section 10702. USE OF NAME "COMMUNITY COLLEGE," "COLLEGE"
LEGISLATURE OF THE STATE OF IDAHO Sixtieth Legislature First Regular Session 2009 IN THE HOUSE OF REPRESENTATIVES HOUSE BILL NO. Title 39: WORKERS' COMPENSATION Repealed by PL 1991, c. 885, Pt. A, 7 Chapter 5: OCCUPATIONAL DISEASES Repealed by PL 1991, c. 885, Pt. 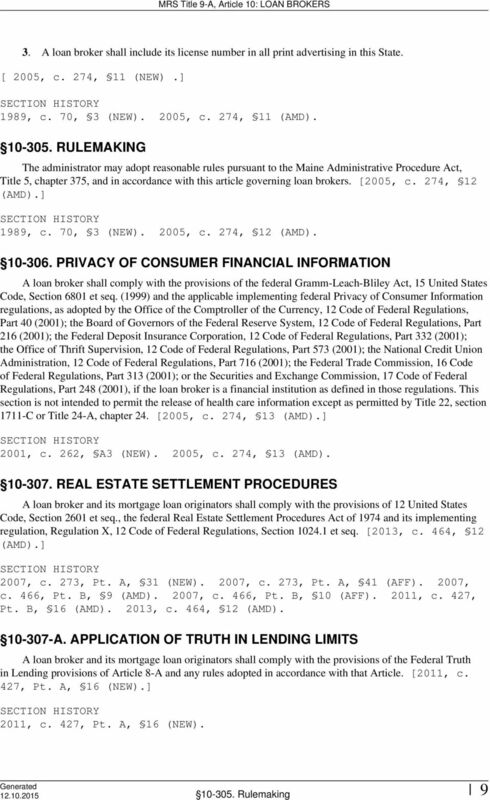 A, 7 Table of Contents Section 181. SHORT TITLE... 3 Section 182. 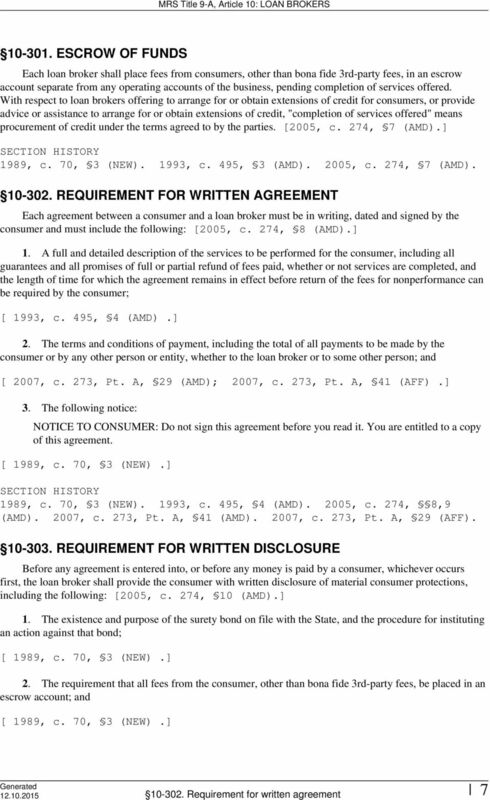 CONSUMER LOAN BROKER ACT. 81-19-11. Investigation of applicant; issuance or denial of license; time limit for acting on applications. 1 MINNESOTA STATUTES 2015 80G.01 CHAPTER 80G BULLION COIN DEALERS 80G.01 DEFINITIONS. 80G.02 REGISTRATION. 80G.03 REGISTRATION DENIAL, NONRENEWAL, REVOCATION, AND SUSPENSION. 80G.04 CRIMINAL CONVICTIONS. 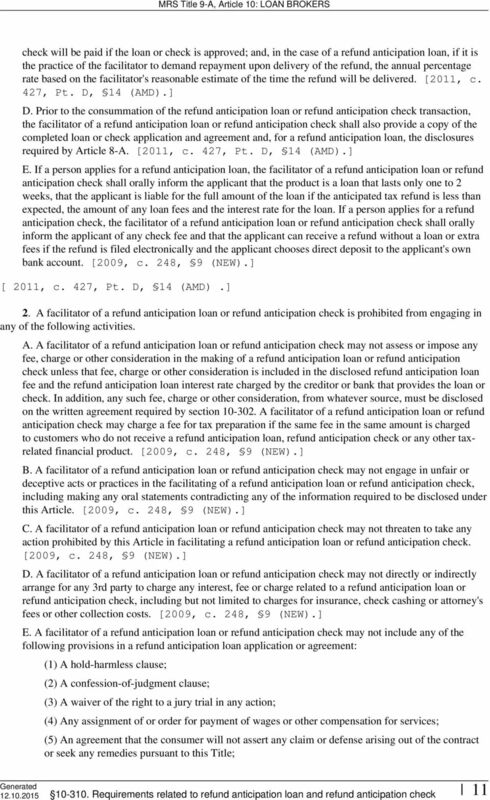 CREDIT REPAIR ORGANIZATIONS ACT 15 U.S.C. 1679 et. seq. TABLE OF CONTENTS. This act shall be known and may be cited as the Appraisal Management Company Registration Act. 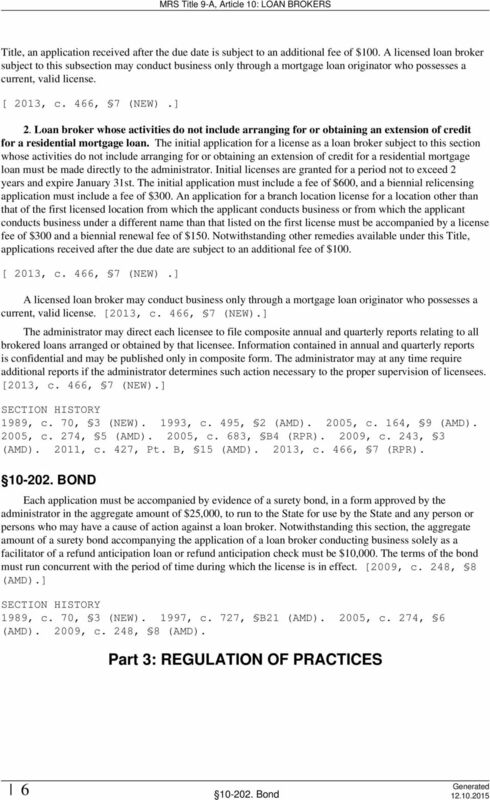 TITLE 12 CHAPTER 19 PART 8 TRADE, COMMERCE AND BANKING MORTGAGE LENDING MORTGAGE LOAN COMPANY REQUIREMENTS 12.19.8.1 ISSUING AGENCY: Financial Institutions Division of the Regulation and Licensing Department. 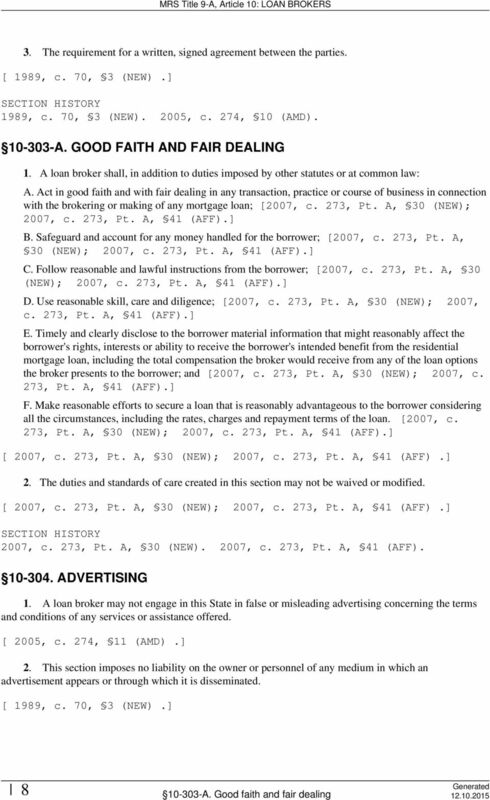 (c) Providing advice or assistance to a buyer with regard to either subdivision (a) or (b) of this paragraph. I1 UNOFFICIAL COPY OF SENATE BILL 660 ENROLLED BILL -- Finance/Economic Matters -- (5lr2457) Introduced by Senator Astle Senators Astle and Exum Read and Examined by Proofreaders: Proofreader. Proofreader. Title 35-A: PUBLIC UTILITIES HEADING: PL 1987, c. 141, Pt. A, 6 (new) Chapter 5: ACCOUNTING HEADING: PL 1987, c. 141, Pt. A, 6 (new) Table of Contents Part 1. PUBLIC UTILITIES COMMISSION... Section 501. SENATE, No. STATE OF NEW JERSEY th LEGISLATURE INTRODUCED JUNE, 00 Sponsored by: Senator JEFF VAN DREW District (Cape May, Atlantic and Cumberland) SYNOPSIS "New Jersey Fair Debt Collection Practices Act." 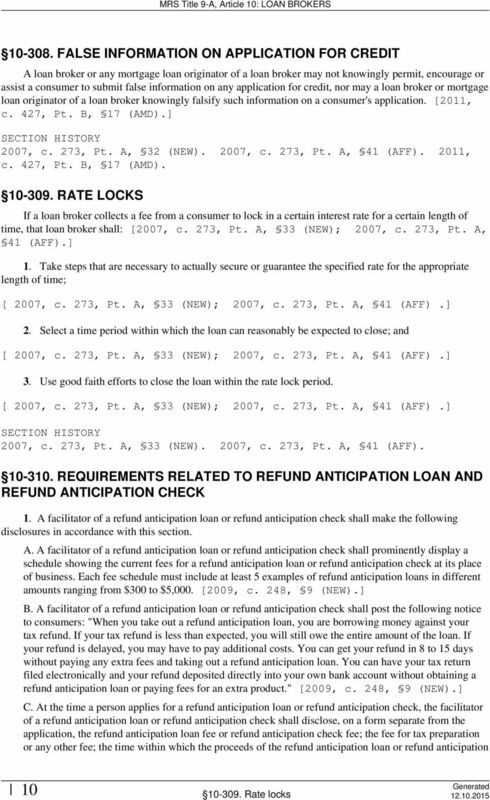 Credit Repair Organizations Act Title IV of the Consumer Credit Protection Act (Public Law 90-321, 82 Stat. 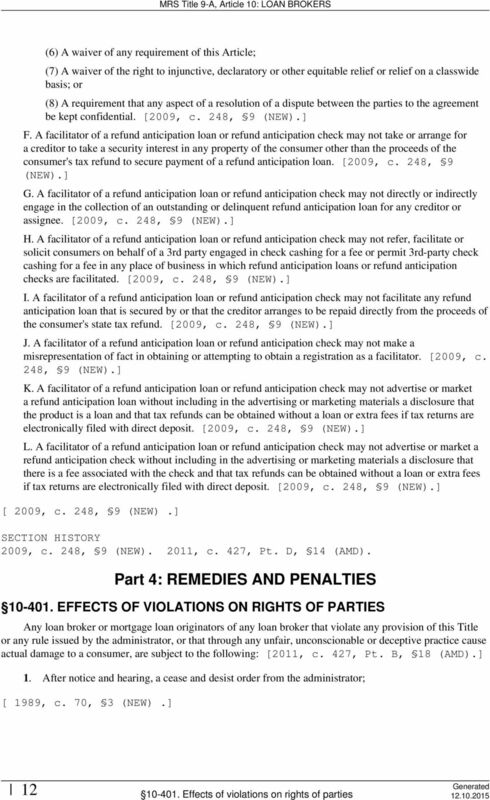 164) is amended to read as follows: TITLE IV--CREDIT REPAIR ORGANIZATIONS'' Sec. 401. Short title. 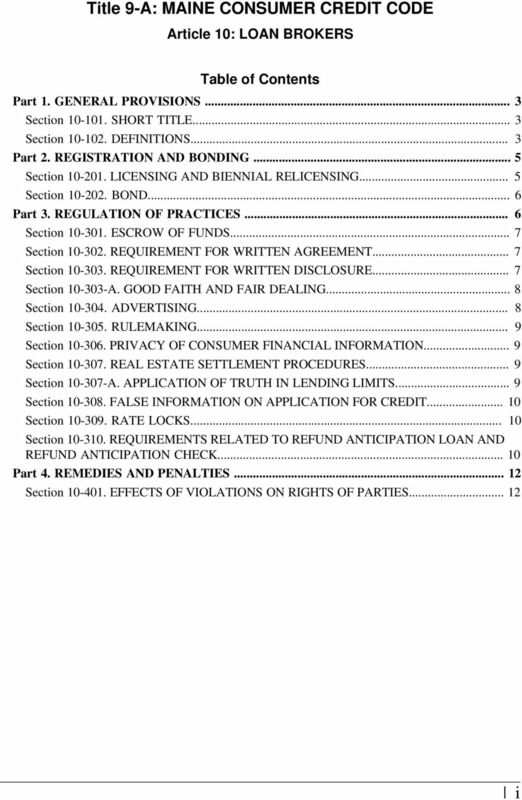 CHAPTER 2--CREDIT REPAIR ORGANIZATIONS SEC. 2451. 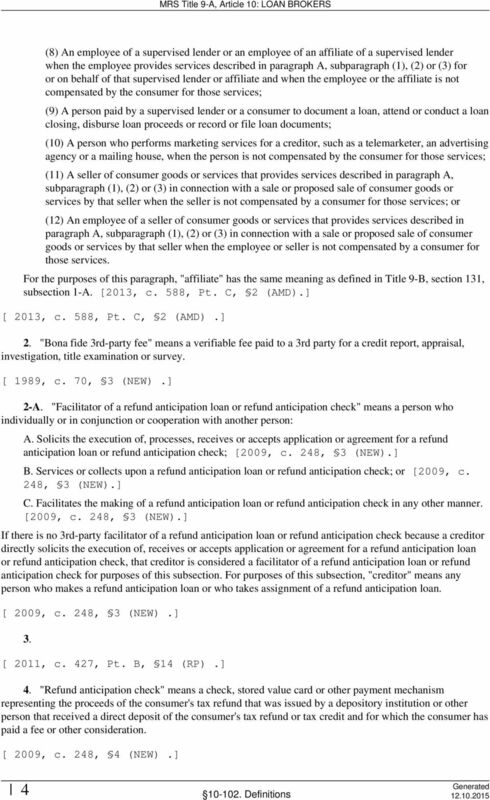 REGULATION OF CREDIT REPAIR ORGANIZATIONS.